I took a good nap after that last post (I only slept a couple of hours on top of biking for close to four) but went for my usual run through the Plateau. I came across this pile of stuff left over from a move. Inside one of the bags was an little AC charger thing. I have no batteries to test it with but it’s in “like-new” condition so I expect that it works. The price tag on the box says it was 54$ (41 on sale). 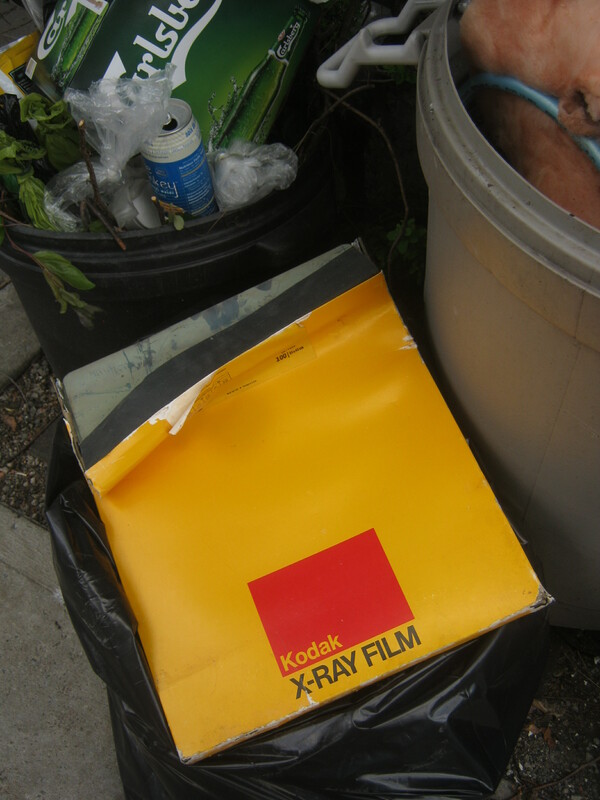 I’d never seen unused X-RAY film before but unfortunately it was ruined by mildew. It had likely been in a basement for far too long. 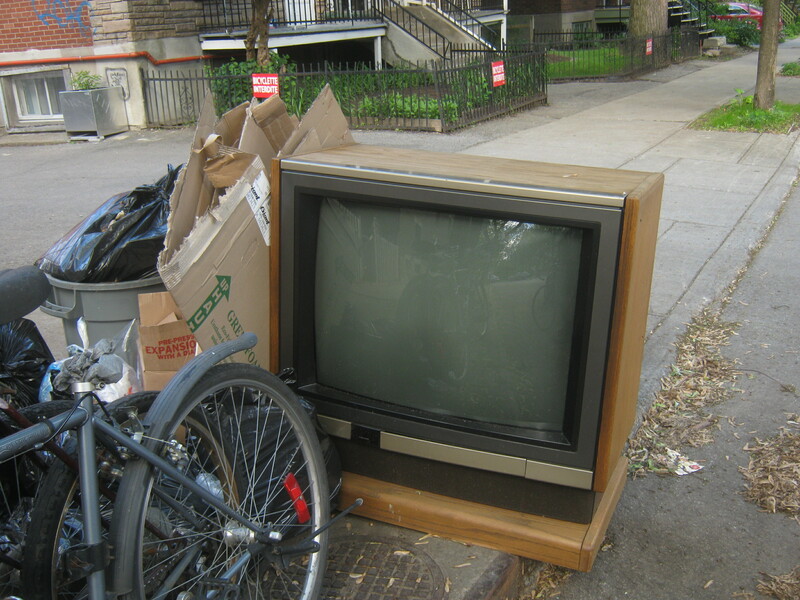 I can only imagine how much this TV weighed! I used to work as a mover and I have (fun) memories of how heavy these monsters can be. 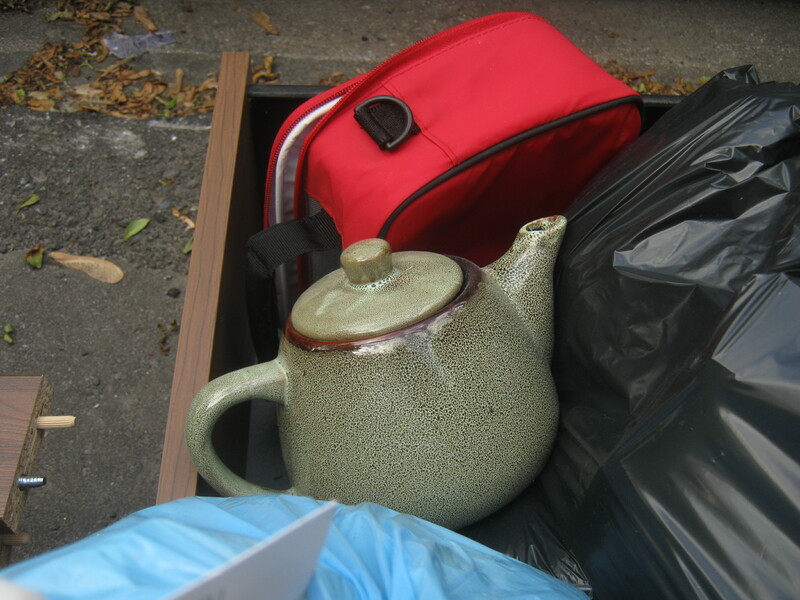 Finally, I spotted this nice ceramic teapot sitting on top of some more moving leftbehinds (yeah, I just invented a word!). I don’t really need one but this had a really nice glaze. If I don’t use it myself I’ll sell it at a yard sale for a few bucks. Today’s my day off which is good because I feel pretty achy. It’s a good opportunity to clean my room and do laundry. I also want to upload the slides I found a while back that I had digitized. I’ll keep you posted! I live in a rural area and all of our ‘unwanteds’ and garbage go to the county convenience center (i.e. several empty lots with dumpsters, spaced all around the county). This is the best mall I shop at…LOL There is the construction trash department for old windows, doors and lumber I use for Sooo many things, the paint department where for free I can custom mix my paints for all my rooms and keep it out of the land fills, the tire department where I can find the perfect size ‘weed kill’ ring for around by trees and plants and the appliance department where I can usually find an old TV to re-purpose into a cute table or shelf unit! Just love shopping and the trash mall! That sounds amazing. I used to live in a rural place and it was easier to find useful stuff at the dump but your specific location sounds really well organized! Something else to think about is when you see furniture that really can’t be re-purposed BUT the hardware can! I always carry a screw driver for each type of screw head! I don’t thing I’ve purchased hardware in many years! It is expensive and I’m not against mixing hardware on the same piece just for some visual interest! And hardware is expensive so if you have a flea market stand, on line store or just having a yard sale, you can make $$ and that’s is always a plus! I live in the middle TN area about 50 miles east of Nashville. All 3 counties I have lived in here in TN were set up that way. I lived in PA until 10 year ago and I know there we just bagged everything up and it went to a land fill….it may be different now. Here they even have a dumpster for newspapers and that comes in real handy because I don’t subscribe but I do a lot of crafts and they come in handy to cover my tables. They also separate glass and you can find some great vintage pieces. Plastic jugs are another dumpster and they are excellent if you cut the bottom off and place them over your young plants…it’s like a hot house until they are stable. I take no shame in looking around when I go…it’s just a little embarrassing when I fall in a dumpster and have to yell for help to get out…I’m short! The attendants laugh at me! Great fun! Those kinds of experience make for an interesting life. 🙂 Kudos to you. I’ve seen that charger for sale on the Internet between $10 and $35. In the box, and with instructions, I imagine you could ask $25. Today morning Atwater library discarded 20 to 22 boxes full of novels,nonfiction books,encycopedias,children’s books,etc.At least 15 or 20 people were around and 90% of the books got taken.I am an old man of 70 and took only six books,but a woman took two boxes on a bike,another other lady took two boxes in her car,another woman took home a carton full of children’s books.Good news is almost everything was rescued.I can only check Atwater library some mornings,but some Wednesday mornings many books are not saved.Please visit Atwater library on Wednesday morning between 10 and 11:00 am and take photos of discarded books. What a waste! There are ALWAYS organizations/schools/nursery/daycare and the list goes on …that would love to have these books! Here in TN, we donate items like that to the churches that have food pantries and so many people are happy to pick one out to take home while they wait to get their groceries! You know grocery stores used to donate the out of date products to shelters and food pantries but then so many go sued, they had to stop it and now all that goes into the dumpsters and the workers are told to mash, crash or wet it down so people don’t come and take it,,,sometimes I get sooooo frustrated with our world today! I’m not ‘old’ but I’m not a spring chicken any more either but in MY day, you would go to great lengths to give food, books, clothing, household items, etc. before you would set them out for the trash! OK…I think I’m over it for now! Thanks for listening! NO, it’s not a “horrible waste”, it’s reality. Books, like clothing and probably other things, are so common that they are a glut. There are endless books, endless book sales, I count 19 in the Montreal area since March and there are still a few to come this summer, and then another cluster in the fall. These are just the ones where English books dominate. Those are dedicated used book sales, there are also plenty of church rummage sales that happen to include books in the things they have for sale. Some of the libraries even have a “store” where a small set of used books are for sale throughout the year. Actually, the Atwater Library has a used book room open something like Wednesday through Saturday. These books are already donated, these are books the library doesn’t want. At least they are going to recycling. The people fussing over the dumped books never do a favor to those books. All they talk about is the great quantity of books being dumped, they virtually never mention titles. As if all books have value. No, lots of books shouldn’t have been published, lots of books shouldn’t have had so many copies printed, lots of books are junk. Talk to the people who have to have the latest bestseller, only to trash it in some way the week after they read it. They might as well get it from the library, or find a used copy. Since the people so hysterical about the dumped books never mention specific titles, it all just adds up to “books shouldn’t be recycled”. It just comes across as more kooks worrying about something without any real interest. Similar announcements about dumped books at McGill University can’t even name the book sale, which is a mark of someone who doesn’t love books. Any book lover knows about the McGill Book Faire, wouldn’t be talking about it in generic terms. Put the blame where it belongs. The groups putting on the sales want to raise prices. Since books are common, they only way they can fix that is to be selective, which is exactly what used bookstores do these days. They justify raising prices by eliminating most of the books from the sale, so you don’t have to dig through all of them to find the “good” books. The McGill Book Faire here used to be the best local book sale, they’d start collecting in April for the end of October sale, and so the amount of books available was amazing. That’s why we’d get in line before the sale started, wanting to find all kinds of neat things, needed to go back and check later, after the books are churned up and the crowds thinner. You never knew what would turn up, I once got a book for 2.00 that people were trying to sell on the internet for a hundred (though I don’t know if anyone was successful at that price). 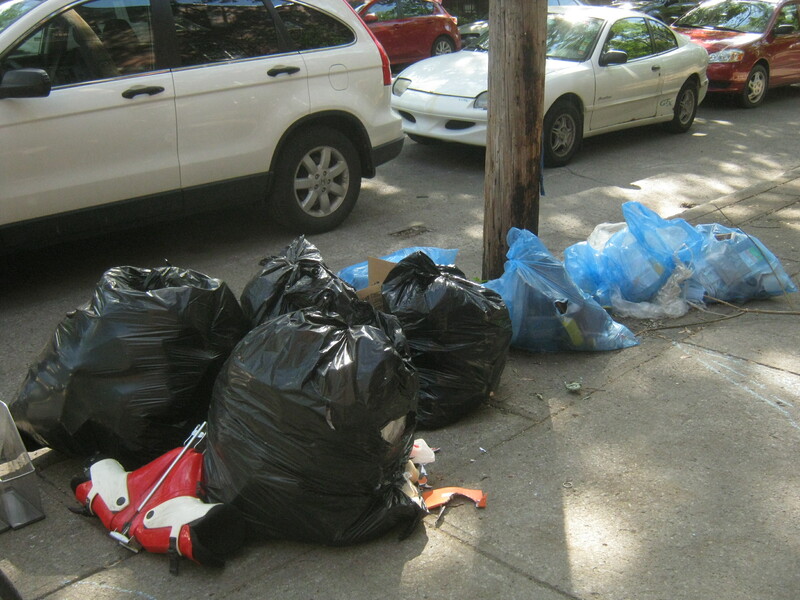 But the organizer decided it was too much work a few years ago and decided massive dumping ahead of time was the way to go. I imagine they got tired of seeing the people with barcode readers come to the sale and skim off the books with a good resale value. Oddly, despite griping about all the books, they changed the start of the collection from April to February. If they put out “a select quantity of quality books” then they can raise prices. And so they dump, because “nobody wants computer books” or romance novels or magazines. Someone was complaining on a blog that he used to go each year for baseball books, and then suddenly they weren’t there. I’ve gone to that sale every year since 1976, and the last 3 or 4 years have had the fewest books up for sale than I can remember. It’s the book sales that are at fault, they have decided what we want, which is only the most recent and popular books, and so the rest is discard. Don’t expect other sales to take the slack, it is more recent sales that started up with the “quality book sales” that were selective in taking books that caused the oldest and biggest sales to become selective. I should point out that the Atwater library used to have one, or maybe two, book sales a year, expected and 3 or 4 day events, a large selection of books. IN recent years, they’ve had more book sales throughout the year, but fewer books, treated less important, and increasingly not worth going to. That’show they treat boosk, it’s not that they are dumping, but that they dump before the sale rather than give the public the chance to choose. very inspiring!! and today i found very classic and valuable plates!! 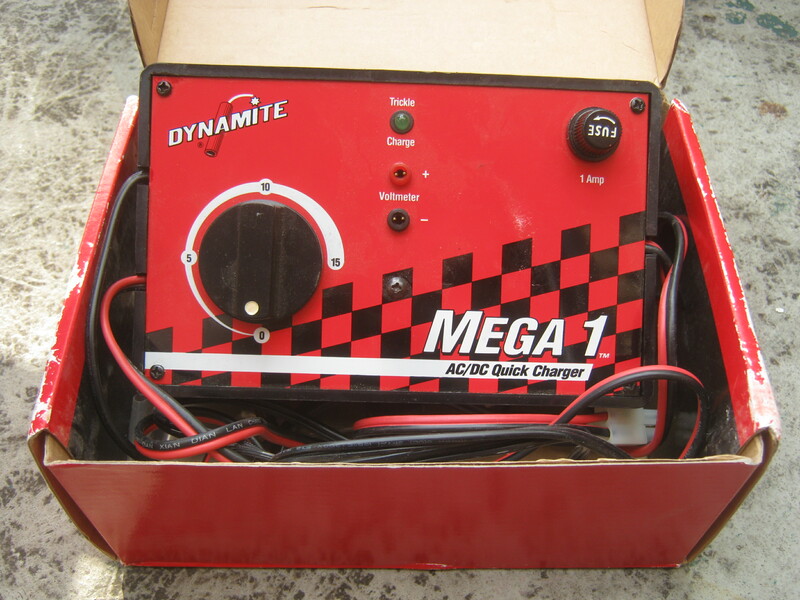 it’s from UK and signature with the handyman!. i will write of what I found in my blog (most of in Bahasa). ..how i’m very inspired of what you have done..
*Pardon of my poor english. will upload soon.. i may need your advise whether its valuable or not, but i still use it if it’s not that precious.. because i love the colors and …. i need a plate :D..